Tamoxifen information. Tamoxifen is a trade name for the drug tamoxifen citrate. 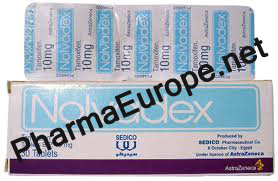 Tamoxifen is a non-steroidal agent that demonstrates potent antiestrogenic properties. Tamoxifen is technically an estrogen agonist/antagonist, which competitively binds to estrogen receptors in various target tissues. With the tamoxifen molecule bound to this receptor, estrogen is blocked from exerting any action, and an antiestrogenic effect of Tamoxifen is achieved. Tamoxifen cycle and dosage. A typical daily dosage of Tamoxifen for men is in the range of 10 to 30mg, the chosen amount obviously dependent on the level of effect desired. It is advisable to begin with a low dosage and work up, so as to avoid taking an unnecessary amount. The time in which Tamoxifen is started also relies on individual needs of the user. If an athlete with a known sensitivity to estrogen is starting a strong steroid cycle, Tamoxifen should probably be added soon after the cycle had been initiated. If estrogen is probably not going to be a major problem during the cycle (but will likely be after), this substance is administered around the time exogenous steroid levels will drop. Some possible side effects. Side effects like hot flashes, menstrual irregularities and a variety of complications with the reproductive system are all possible.